The Motorola Moto X Force offers something unique: a flagship smartphone you don't need to hide in a protective case. We've seen so-called ruggedised high-end phones before, of course, most recently in the shape of the Samsung Galaxy S6 Active. But you wouldn't feel comfortable whipping that monstrosity out onto a pub table filled with iPhones. That's where the Moto X Force comes in. It's a £499 Android phone with a metal frame and most of the key features you'd expect of a modern flagship, but one that'll also survive a trip to the pavement unscathed. It sounds too good to be true, but Motorola has pretty much pulled it off - with a few minor exceptions. Motorola has undoubtedly scaled back the design of the Moto X Force compared to its current fashion-focused flagship, the Moto X Style. But not by as much as you might think. The Moto X Force is slightly smaller and lighter than the Style, with a 9.2mm thick body that weighs in at a reasonable 169g. It also sticks with the same kind of classy aluminium frame, which was also seen in last year's Nexus 6. Once again you can specify a number of design details for the Moto X Force, including the type of material the back cover is made from. Our test unit came with the default 'Ballistic Nylon,' which you could potentially use to remove hard skin from the sole of you foot. It's grippy alright. 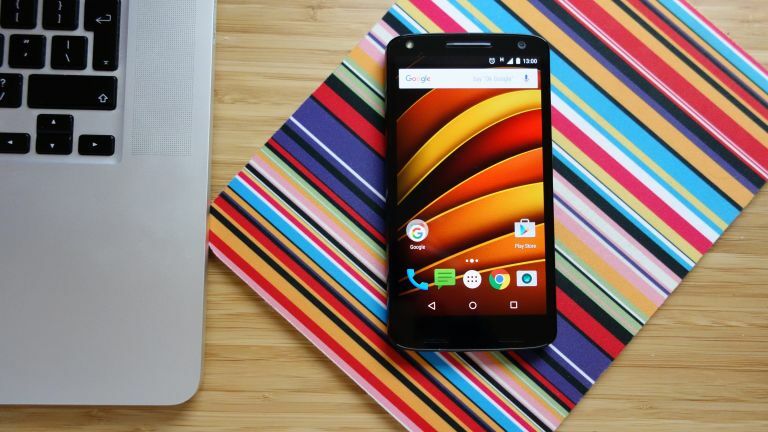 The Moto X Force generally looks and feels the part, but there have been a few compromises along the way. The outer layer of its toughened screen is visible around the speakers like a cheap plastic protector, while the elegant stereo speaker bars of the Moto X Style have been jettisoned for a more prosaic alternative. Still, any attention on these flaws is likely to be diverted when you power up the screen. Motorola has opted for a slightly unusual 5.4-inch display size, which is a little smaller than the usual 5.5-inch 'phablet' brigade. This is still very much a large phone, though, and you'll need two hands to operate it comfortably. The Moto X Force display packs in a QHD resolution, which works out to 2560 x 1440 pixels. That's the same as the Samsung Galaxy S6 and the LG G4, so you won't be picking out any individual pixels here. Having said that, Force's extra-thick display (more on which in a bit) does mean that the picture doesn't quite pop like some of its flagship rivals. Motorola has gone with AMOLED panel technology, which makes for a highly saturated picture and deep blacks. If you're coming from a cooler LCD screen like that of the iPhone 6S, you might find it a little yellow, and it's a shame you can't adjust that. It's something we've all faced at one time or other. That horrible moment where you realise your phone is headed for the tarmac, and you're just waiting for that sickening crunch. By far the biggest feature of the Moto X Force is its five-layer ShatterShield display, which all but eliminates the above scenario. We have dropped our Moto X Force from just above waist height onto a hard kitchen floor a couple of times, and have even seen it bundled down a flight of hard office stairs. Still, it doesn't sport so much as a scratch. It's worth noting that Motorola positively encouraged such abuse, and even suggested an ideal test scenario of a five foot drop onto a tile surface. If that's not reassuring enough, Motorola has guaranteed each Moto X Force screen for four years. Almost as robust as the Moto X Force's display is its battery life. Its 3760mAh battery is 25 percent bigger than the Moto X Style's, and is larger still than the Samsung Galaxy S6's. That larger-than-average battery pays off. We were able to get through a good day and a half of moderate usage on a single charge, while light usage could see that stretched to a full two days. Motorola has also continued its photographic renaissance, with a similar 21-megapixel rear camera to the one found in the Moto X Style. This is capable of taking speedy, sharp pictures in varying light levels - though we're still not too keen on Motorola's custom tap-to-shoot camera UI. This is the fastest phone in the Motorola fleet, thanks to a 64-bit Snapdragon 810 CPU, which has been paired with 3GB of RAM. This boosts it to a general level of zippiness that's not too far short of the Samsung Galaxy S6 and the iPhone 6S. Playing graphically intensive games like Dead Trigger 2 and Need For Speed: No Limits posed no problem whatsoever. That's the obvious application of all that power, but the Moto X Force is quick in general usage too. As is Motorola's commendable custom, it comes with a stock version of Android, so it's not weighed down with needless apps or a sluggish custom UI. This is Android as Google intended it, and it operates as smoothly as it's ever done outside of the Nexus 6P. Motorola's lack of tinkering means that the Moto X Force is one of the better Android phones to use. Android 5.1.1 (a 6.0 update will be along soon) is crisp and intuitive, and thanks to Google Now it's pretty smart too. Did we say that Motorola had refrained from tinkering? Then we've misled you a little. The company has added a couple of elements of its own, but they all serve a practical purpose. We're particular fans of the Moto Display provision, which displays key information on the screen when you place your hand nearby. Thanks to that AMOLED screen tech, only the time and any recent notification symbols will light up, saving power. Tap and hold one of those symbols and you'll get a discrete preview of the message's content, which you can then jump to with an upward swipe. You can access this feature and more in the Moto app. This also enables you to set up Motorola's own voice assistant, which has the benefit of working while the screen is powered down. Motorola was one of the first to get in with such a feature, but we found it struggled to pick up our launch phrase from setup onward, and it's less essential now that Google Now has a similar voice function built in. If you want a phone that's as resilient as it is powerful, yet doesn't look like a workman's lunchbox, the Moto X Force is a compelling new option. It's a very well rounded, highly capable flagship phone with exemplary battery life, a pin-sharp QHD display, and a highly capable camera - yet it can also survive being dropped onto the pavement. The Moto X Force doesn't quite have the level of desirability or outright cutting edge components of Samsung's and Apple's top efforts, but if you've ever discounted one of those on the grounds of their brittleness there's now a strong alternative.